My predominate art medium has been polymer or resin based — as a sculpting material (epoxy clay) and casting liquid resin in silicone molds. Have been doing this for years so have my generally, trouble-free routine: sculpt – mold — resin cast – lightly sand – spray primer coat – paint – varnish – DONE! Easy-peasy! The standard material used in 3D printing is ABS and PLA, both are thermoplastic polymer material that becomes soft and pliable when heated. It is close to resin in that they are polymer based and have many of the same properties. The DaVinci XYZ 3D printer we have uses only ABS filament, producing a very hard plastic model (Legos are made from ABS). 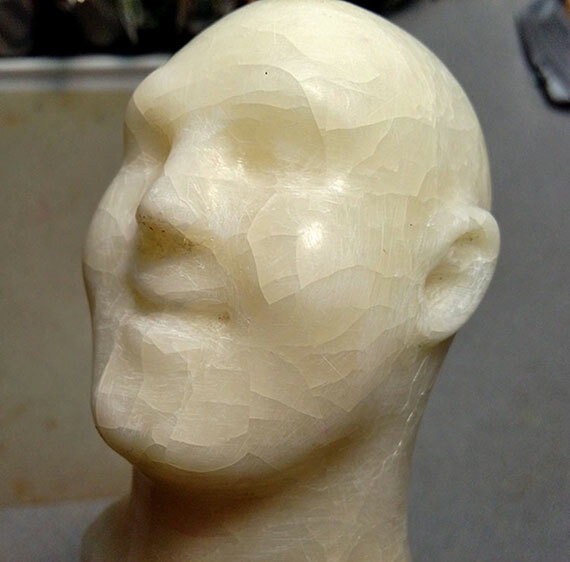 Referring to our 10/26/16 post : 3D Printing – Slice, Print & Smooth we went into detail about preparing a 3D Model, Printing and how to Smooth the filament ridges using the Cold Vapor Bath method. The Cold Vapor Bath produced a smooth, glass-like surface on the printed model but we know there needs to be some texture for the paint to “stick” so the surface needed some roughing up. Sanding alone did not get into the small, corners and crevices so the model was placed into a vibratory rock tumbler with ceramic pellets, run until the models had a matte finish (about 45-60 minutes) then washed with dish soap to remove the powered residue. 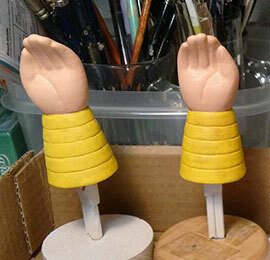 I followed my regular routine — models were lightly sanded before applying primer. I usually use Krylon white primer on cast resin but thought for the ABS plastic would be best to use Rust-Oleum 2X Ultra Cover primer with “Bonds to Plastic” on the label. 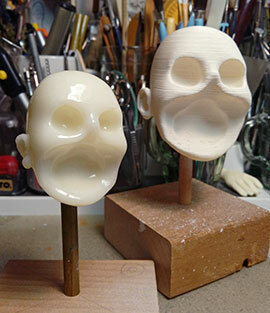 I let the models dry 24 hours as usual, then returned to apply the acrylic paint base coat. To my dismay the primer coat easily SCRAPED RIGHT OFF leaving the pieces patchy and uneven! The primer coat would have to be totally removed and start again. I first tried sanding the primer off with a Dremel paddle sander, but this was not very effective. Denatured Alcohol was applied to the first piece, easily removing the primer, but within a few minutes the model developed cracks on the surface! Nothing could be done to fix the piece, the integrity was in question so the only solution was to print the models over again. Printing the models takes a few days so I did not want a repeat of the previous problem. To my dismay, ALL the primers we have stated they can be used on plastic, I did not know what to trust so went do some research on which primers were best to use on ABS plastic and why the cracks happened. While the Cold Vapor Bath is recommended to “weld” the ABS layers together to create a stronger piece, I was still uncertain if the Cold Vapor Bath contributed to the problem by producing such a glossy surface; the Denatured Alcohol reacted with the ABS; if I was too heavy-handed with the Dremel sander; or the vibration of the rock tumbler and ceramic pellets that may have weakened the ABS causing the stress cracks. After days of researching 3D print sites, one possible cause of the stress cracks was attributed to “excessive sanding” which could have been the paddle sander and /or the rock tumbler used to sand the gloss surface. But my greatest mistake was breaking the cardinal rule of neglecting to read the directions printed on the can — it was suggested to wait AT LEAST A WEEK to let the primer set on the ABS! To avoid future problems I did more research to find alternative solutions to removing/refining the print ridges from the printed model. 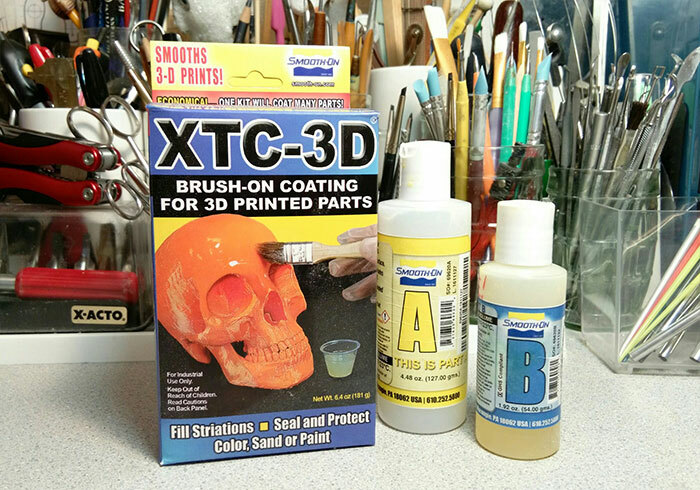 XTC-3D High Performance 3D Print Coating is a 2-part brush-on coating for 3D prints from Smooth-On. The coating self-levels, flowing into creases – use caution to ensure the coating will not pool too much in low areas that can lose detail – this can be removed with small disposable brushes. Multiple thin coats (a little goes a long way) can be applied until the ridges are covered, let each coat dry and lightly sand between applications. The finished coat produces a shiny smooth surface much like the Cold Vapor Bath. Applying 2 coats of XTC-3D filled in the printed ridges very well. 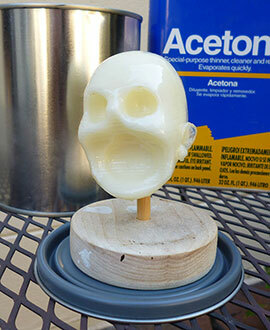 The advantage of XTC-3D is it can be applied only to the areas needed, for example the Skull form used as a base to sculpt on, I want to keep the ridges for the epoxy clay to adhere to but want the top of the head and ears to have a smooth finish for primer and final paint. The glossy surface still needed to be sanded but this time went back to my trusty emery cloth and hand sanded rather than use the vibrating rock tumbler. I used the Rust-Oleum 2X Ultra Cover primer again, applying very light, multiple coats, AND THIS TIME set the parts aside for a week. IT WORKED!! I was able to proceed with the acrylic base coat and on to finishing the pieces. Research indicated that the vibrating rock tumbler could have been the cause of the stress cracks because it is too hard on plastic. Many posts recommend a standard rock tumblers along with ceramic media and plastic pellets, but also using a vibrating tumbler, so not sure what to think. Still not 100% sure what caused the cracks, just grasping at this point, have not found other makers with the same problem. I may have to contact 3D printing forums to see if they can help figure it out, but for now I will just rely on the most important Lesson learned: READ THE INSTRUCTIONS! New parts primed and painted! 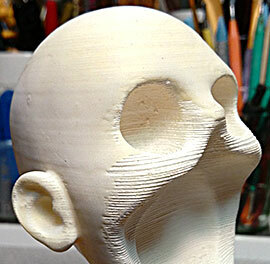 Upcoming post : I will explain how to use XTC-3D to smooth 3D prints…. stay tuned!